GCCI at 401 Healdsburg Ave.
“Zero clearance is what we have. When you build in a downtown area it’s a real challenge,” says Mike Gentry of GCCI. “We have no staging area, so we schedule the delivery of materials as we use them. This takes a lot coordination on everyone’s part including our sub contractors.” It’s the first thing Gentry mentions when asked about the project at 401 Healdsburg Ave., a 20,000 square foot, 2-story commercial building located at the corner of Healdsburg Ave. and North Street in Healdsburg, just off the Healdsburg downtown Square. Architect Chuck Peterson of Santa Rosa designed the building. 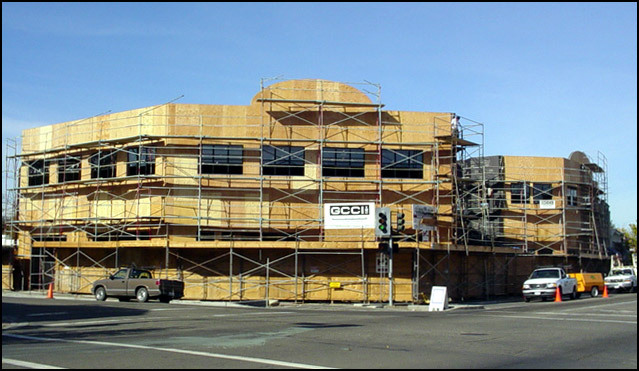 Seismic retrofitting is another specialty of GCCI. “One of the biggest projects we did was an existing 12-story high rise building – Bay View Federal Savings, one million pounds of steel were used to reinforce that bank,” according to Gentry.